Junior A Aurora Tigers captain Steven MacLean is trading in his Tigers yellow for Golden Hawks gold. 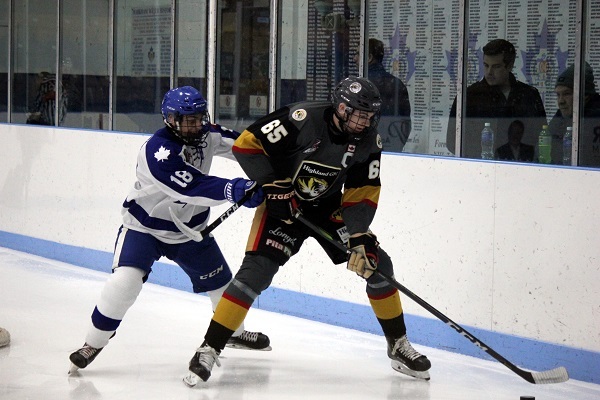 The towering defenseman is moving on thanks to a commitment to the Wilfrid Laurier Golden Hawks hockey program, making it official late last week. “Steven has been a positive influence on our organization and the Town of Aurora,” said Tigers owner Jim Thomson. “He attended every public appearance in our town and spent countless hours helping kids away from the rink. Thomson’s own son, James, is also a member of the Golden Hawks, after splitting his OJHL playing career between the Tigers, Newmarket Hurricanes, and Trenton Golden Hawks. Both MacLean and Thomson play a similar style of game as a big-body, long-reach presence on the blue line: though MacLean has certainly stepped up his offensive production since being named captain of the Tigers last fall. He doubled his point production in the 2018-19 season, despite the team faltering down the stretch and ultimately falling to the Hurricanes in the OJHL’s opening playoff round. MacLean posted six goals and 22 assists through a 53-game season, while adding one more apple in five postseason games. A native of Scarborough, MacLean spent his entire junior hockey career with the Tigers, playing for three seasons after a minor career with the Toronto Aces. He will be looking to help right the ship on a Golden Hawks squad that finished the U Sports season ranked twenty-third in the nation.